There’s just no getting around the fact that Stanley Warner’s management of Cinerama was a disaster from the word go. To be fair, the limits imposed by the court gave SW little incentive to think beyond the short term: They could have no more than 24 Cinerama theaters, and they had to be out of Cinerama by the end of 1958 (SW did get a court-approved extension to that deadline). Still, with the purchase of International Latex, Stanley Warner behaved like a kid with a new toy. Cinerama became the old toy. SW never operated more than 22 Cinerama theaters at one time, and they never produced enough pictures to keep even those busy (and nowhere near the court-imposed limit of 15 pictures). When they did produce a new Cinerama picture, all they could think to do was produce yet another travelogue, the only real change being where the picture traveled to. Even then, as we have seen, SW would delay release until they had wrung the current release dry; they insisted every picture had to premiere in New York, yet they wouldn’t open a second New York theater. Nor would they even consider beginning a new picture while they had one waiting in the wings; the idea of creating a backlog of pictures ready to go appears never to have been considered. In 1957, when the foreign-rights agreement with Robin International expired, Stanley Warner ventured into that area themselves. They learned a lesson, though, from Nicolas Reisini’s practice of sub-licensing Cinerama to local exhibitors, who would pay to convert a theater, then lease rather than purchase the equipment from Cinerama Inc. Essentially, what Reisini had done, and what SW did now, was to sell Cinerama “franchises”. It was a policy that might have served Cinerama well from the outset — and indeed Reisini would employ it with some success after he took the driver’s seat — but it seems not to have occurred to anyone before Reisini came along. In the end, Stanley Warner’s program of opening new Cinerama theaters was no more vigorous or aggressive than their production of Cinerama pictures. By the time SW’s management was drawing to a close, most of the theaters they’d opened had failed and been closed; only six remained in the U.S., with another 13 in other countries. Part of the problem all along was Cinerama’s Byzantine corporate structure, which hampered any attempt to strategize Cinerama for the long run. Instead of one central corporation, Cinerama was first three, then four, all severely undercapitalized and with complicated financial relations. A serious simplification of the arrangement was called for, but Stanley Warner never made any effort in that direction. As the clock ran out on Stanley Warner Cinerama, Reeves stepped up his efforts to consolidate things. I won’t go into all the arcane details, but the process entailed enlisting the participation of the Wall Street brokerage firm of Kidder, Peabody and Co. 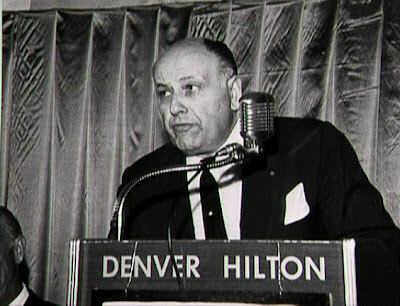 There was a flurry of stock sales, purchases and swaps as Buz Reeves gradually consolidated his control, and with his proven management expertise he was able in May 1959 to float a huge $12 million expansion loan from the Prudential Life Insurance Co., three-to-four million of which was used to buy out Stanley Warner once and for all. When the dust finally settled, Vitarama Corp. and Cinerama Productions Corp. were no more, absorbed into Cinerama Inc. And Hazard E. Reeves was in complete control of every facet of the process — something that had not been the case since Fred Waller formed Vitarama 21 years before. Nicolas Reisini was, if nothing else, an energetic and ambitious entrepreneur and wheeler-dealer, and he hit the ground running. Even before assuming the presidency of Cinerama in May 1960, he accomplished something nobody before him had been able to do: He established a co-production agreement with a major studio. The studio was MGM (then flush with the critical and box-office success of Ben-Hur), and the agreement was announced on December 11, 1959: They would produce at least two and as many as six features; MGM production chief Sol C. Siegel would supervise them, with Cinerama having script, director and cast approval; Cinerama would distribute and exhibit the pictures in their theaters, and MGM would handle distribution of 35mm general release versions after the Cinerama roadshow engagements. Reisini’s touring “Cinerama Europe” was well-received everywhere it went; anyone who wasn’t working or in school would flock to the field where Cinerama was setting up to watch the battery of huge fans, each the size of a Volkswagen, blowing up the big blue tent. Local dignitaries turned out to walk the red carpet at every screening. Even Abel Gance showed up one night to see this successor to “Polyvision” from his 1927 Napoleon. The tent had an Achilles’ heel, though, and it was the anchoring system, which was inadequate to a building of its size. One night in France a terrible storm struck. It huffed and it puffed and it blew the house down; the collapsing screen wiped out the first ten rows of seats. A genuine catastrophe was averted only because nobody was in the tent at the time. Undaunted, Reisini had the tent design revamped, strengthened and improved. This new version went on to tour England, Scotland and Wales as “Itinerama”. At the same time, Reisini set out to expand the paltry stable of standing Cinerama theaters that Stanley Warner had left behind. Within nine months, by selling franchises to local exhibitors, Reisini had nearly doubled that number by opening 17 new theaters. 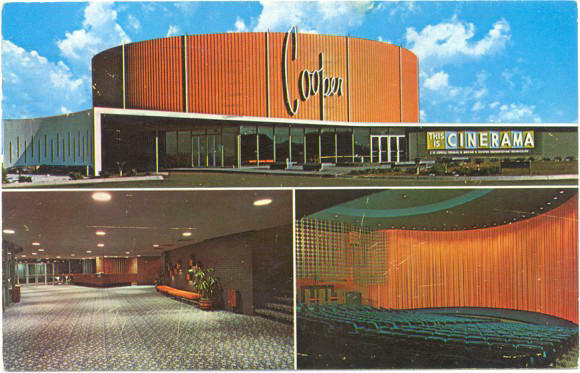 Among them, opening in March 1961, was the first theater built expressly to show Cinerama, the Cooper “Super-Cinerama” outside Denver, Colo. By 1964, Reisini’s expansion efforts had been perhaps his most striking success: 70 theaters in the U.S. and 116 overseas — nine times as many theaters as Stanley Warner had been able to open on their own. Now let’s review. 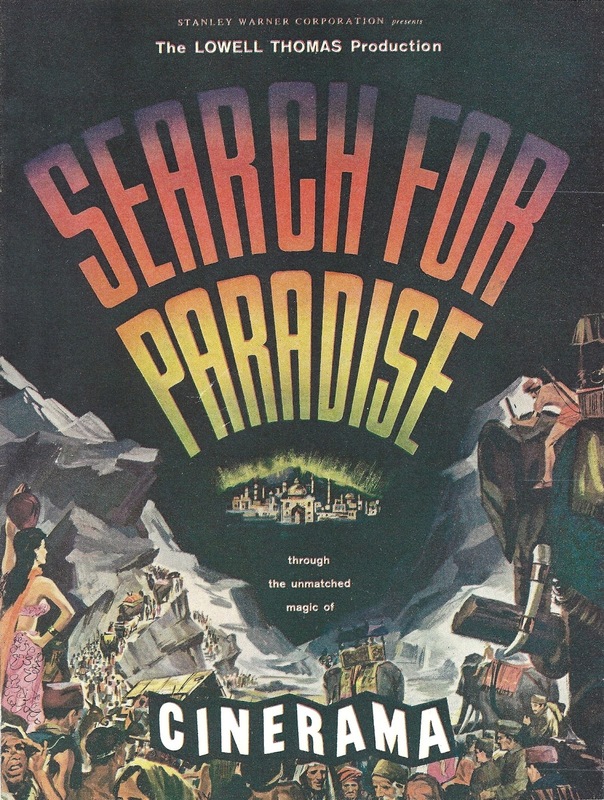 By the end of 1962, Nicolas Reisini had inked a co-production deal with a major Hollywood studio; he was well on his way to establishing over 180 Cinerama theaters worldwide; and — another thing nobody else had been able to do — he had come out with two Cinerama movies in the same year. The Wonderful World of the Brothers Grimm — the second picture to go into production but the first one released — opened in August 1962. It got novelty points as the first “story” Cinerama picture, but reviews were not great, and neither was the box office. 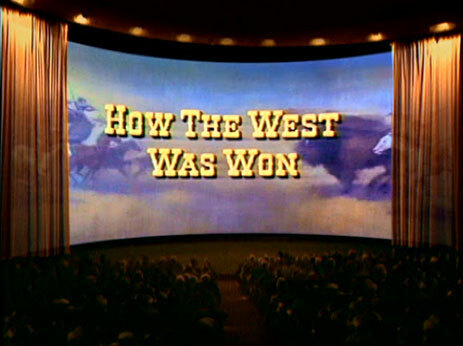 How the West Was Won, however, was another story. It premiered at London’s Casino in December ’62 (the U.S. premiere was at L.A.’s Warner Theatre in February ’63) and was an immediate smash hit. It got rave reviews from all but the snootiest critics and played to sold-out houses for over a year. We can only speculate how the Cinerama saga would have shaken out if Nicolas Reisini — or someone else with his energy and ingenuity — had taken the process in hand back in 1953. Things might have been very different. On the other hand, Cinerama might have died in its cradle; the process’s astronomical operating costs might have undone Nicolas Reisini in the mid-’50s — because they were what undid him now. How the West Was Won — which went on to snag eight Oscar nominations, including best picture, and to win three — was universally acknowledged in 1963 as the best movie ever made in Cinerama. And it’s still the best — because it was the last. While the movie cleaned up at the box office, the problem was the same old bugaboo: as much as 80-90 percent of the take went to the overhead expenses of running the theaters. Reisini had wagered $13.5 milllion on Brothers Grimm and HTWWW (Cinerama’s share of the production costs), and when all was said and done, the profits didn’t begin to cover his bet. Not all of HTWWW had been shot with the three-lens Cinerama camera. There were some stock shots inserted from MGM’s Raintree County (1957), which had been shot in MGM Camera 65 (actually a variety of Panavision), and John Wayne’s The Alamo (’60), which had been in Todd-AO. In both cases, the original one-frame negative had been split optically into thirds to run through the three Cinerama projectors. Also, a number of risky shots — Karl Malden and Carroll Baker battling the river rapids on their raft, for example, or Eli Wallach clinging to the undercarriage of a runaway train — were done using back-projections, which couldn’t be shot in true Cinerama; instead, they were shot in UltraPanavision (which combined 70mm film stock with a slight anamorphic squeeze) and, again, split optically. This was the penultimate nail in the coffin of three-frame Cinerama. Look [the word went], we used Panavision in all these shots in HTWWW and nobody noticed the difference. (That wasn’t true, by the way; there was a sharp degradation of photographic quality. It’s just that the scenes were so exciting nobody minded.) Still, with cash-flow problems hammering at the door, Reisini saw no choice but to trim overhead by abandoning three-screen exhibition. He ordered a stop to all research into perfecting Cinerama (I’ll get into that next time) and announced that henceforth all “Cinerama” pictures would be shot in UltraPanavision. It wasn’t enough to save his job. Enter William Forman of Pacific Theatres. Several of his theaters had installed Cinerama equipment, and Forman jumped in with both feet in February ’63: for $15 million he bought up the note Prudential Insurance Co. held from their 1959 loan of $12 million, and with it he acquired a series of stock options, all of which he excercised, to the point where he replaced Nicolas Reisini as president and CEO in December ’63. Reisini remained as chairman of the board for the time being, but in September ’64, with Cinerama Inc. teetering on the edge of bankruptcy, he resigned even from that, effective immediately. William Forman was now in charge, and Pacific Theatres retains control of Cinerama to this day. 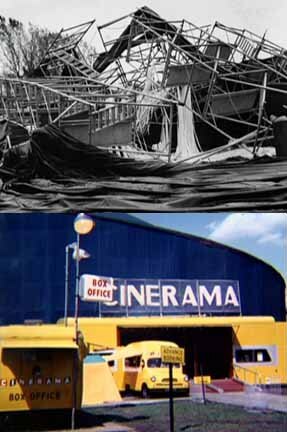 Forman ratified Reisini’s abandonment of the three-screen Cinerama process, and from that point on Cinerama became a releasing rather than a producing corporation. There has never been another feature produced in Cinerama; pictures bearing the name — It’s a Mad, Mad, Mad, Mad World; Khartoum; Grand Prix; 2001: A Space Odyssey; Ice Station Zebra; etc. — were actually in UltraPanavision, using the familiar accordion-fold logo to evoke the magic of Fred Waller’s process that was no more, to an audience that had heard of but never seen the real thing. You must be doing this to eventually write a book if not then you should and I now want a thank you credit when the book does come out. Can' t wait for the festival to start! During HTWWW, I'm going to watch carefully to see I can tell the different camera shots; thanks for pointing this out. I love the photo montage of the Cooper "Super Cinerama" you've posted. It certainly illustrates the big vision of Cinerama. Thanks again for another wonderful series. One advantage of your site is that you can tell a compelling story over many chapters. Unlike a magazine article, which has to condense all the highlights into one entry. Fans like me, who missed out on all these facets of the movies when they first happened, owe you a great debt. I can't wait to see what's next! HI – I am researching the work of a British architect called Cedric Price (1934-2003). He lists amongst his projects a design for a tent for a client in Holland (1963-71), and the photos in his archive show the more robust version of the tent with tilted roof. The textual records of the project are thin and inconclusive. Do you know who designed that tent? I wonder if Cedric got his hands on a decomissioned one and reused it for his own client's purposes? Any clues would be greatly appreciated! Welcome,Samantha! And please forgive the delay in responding to your request. I'm afraid I can't tell you much more about the traveling Cinerama tent than is already in my post. Most of my info came from David Strohmaier's excellent documentary Cinerama Adventure; you can learn more about the documentary at the link. Also, there's a "Contact Us" page where you can get in touch with Mr. Strohmaier directly for further information; I've always found him very prompt and helpful. There's also more about Cinerama's history at the In70mm Web site; a little sloshing around may lead you to more details about that tent. If Cedric Price's tent project for his Dutch client started in 1963, seems to me it could well have involved a decomissioned "Itinerama" tent. That was around the time Nicolas Reisini was trying to regroup and shore up Cinerama's finances (eventually getting nosed out by William Forman and Pacific Theatres), and he might easily have been happy to unload the tent on a respected architect who had a use for it. This, however, is purely speculation on my part; David Strohmaier or somebody at Pacific Theatres might perhaps shed some light on the question. Good luck and good hunting, and thanks for stopping by!